No no no no, we did not say that....we still hero-worship doctors..for us it is the ultimate noble profession. But then according to Dr Sandeep Jauhar, things are very wrong with the medical community in the USA. He speaks as a person from within the belly of the beast, and he claims to speak on behalf of the many outstanding doctors from the Indian American community (and the medical profession as a whole). Who knows if there is any substance in his (devastating) allegations...common people will tend to think that no smoke can result without fire. The growing discontent has serious consequences for patients. One is a looming shortage of doctors, especially in primary care, which has the lowest reimbursement of all the medical specialties and probably has the most dissatisfied practitioners. Try getting a timely appointment with your family doctor; in some parts of the country, it is next to impossible. Aging baby boomers are starting to require more care just as aging baby boomer physicians are getting ready to retire. The country is going to need new doctors, especially geriatricians and other primary care physicians, to care for these patients. But interest in primary care is at an all-time low. Perhaps the most serious downside, however, is that unhappy doctors make for unhappy patients. Patients today are increasingly disenchanted with a medical system that is often indifferent to their needs. People used to talk about "my doctor." Now, in a given year, Medicare patients see on average two different primary care physicians and five specialists working in four separate practices. For many of us, it is rare to find a primary physician who can remember us from visit to visit, let alone come to know us in depth or with any meaning or relevancy. Insensitivity in patient-doctor interactions has become almost normal. I once took care of a patient who developed kidney failure after receiving contrast dye for a CT scan. On rounds, he recalled for me a conversation he'd had with his nephrologist about whether his kidney function was going to get better. "The doctor said, 'What do you mean?' " my patient told me. "I said, 'Are my kidneys going to come back?' He said, 'How long have you been on dialysis?' I said, 'A few days.' And then he thought for a moment and said, 'Nah, I don't think they're going to come back.' "
My patient broke into sobs. " 'Nah, I don't think they're going to come back.' That's what he said to me. Just like that." It is the Holy Grail for almost every Indian parent: that their son and or daughter go to medical college, become doctors, and embark on a thriving career that brings laurels - and sure, some lolly. ...It's no different with NRIPIO parents, in the US, UK, or elsewhere, which is why the nearly 100,000 Indian American physicians in the US includes some 20,000 who are either born or have grown up in America and graduated from US medical schools. Dr Sandeep Jauhar has been there, done that - and not liked it one bit. And he's blown the whistle on his profession - or ripped it apart with a scalpel. Medicine, as practiced in the United States, is sick - very, very, sick. In a devastating - and immensely self critical - book that is making waves in the US, the Indian-American physician, with specialization in cardiology, describes how the medical profession has become a pitiless, mercenary medical profession, money ripping vocation where doctors treat patients as revenue generators rather than human beings, keep patients in hospital longer than necessary to bill them more, order needless tests to generate profits, and cozy up with drug reps helping predatory pharmaceutical companies sell dangerous drugs. American doctors - and that includes Indian-Americans like himself -are suffering from a "collective malaise" of discontent, insecurity, and immoderation. None of this is a great secret; discerning patients, activists, and even many physicians themselves have recognized this for a long time in the US. 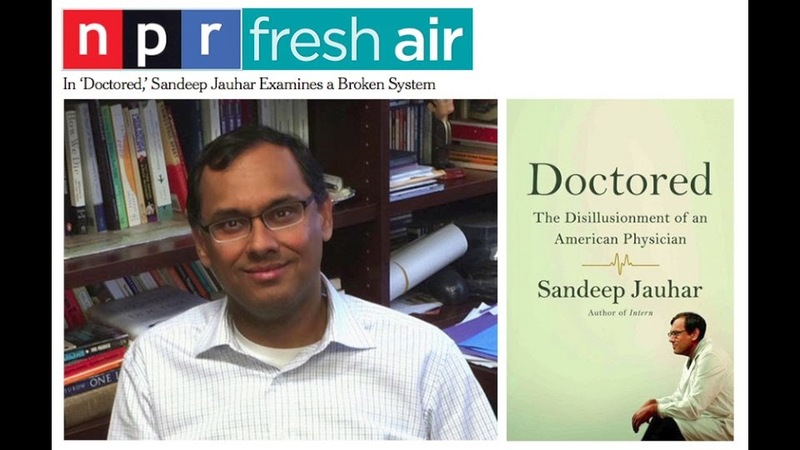 But its Dr Jauhar's astonishing candor in `Doctored: The Disillusionment of an American Physician' that has shocked the medical fraternity and layman alike, shattering the image of the doctor as a do-gooder -and for Indians, that of the NRI physician as the epitome of nobility. No one comes out looking good in this tortured, self-lacerating book: not Jauhar himself, nor his brother (also a cardiologist), nor physician friends and mentors, and not the American system. This is the Ferguson moment in medicine - ugly but true. Asked in an interview on Thursday if he intended to stay on in the medical profession at all, given the shock and horror his book is creating (the NYT reviewer said this is the first book that's prompted her to write "Yuck!" in the margin), Dr Jauhar said he owed it to his readers to give them the unvarnished, unfiltered truth, without being irresponsible. "Probably the person who comes in most for criticism is myself. When you are willing to be self-critical, people will appreciate it," he told me gravely, after initial jokes about his taking potshots at his own family, including his father, subsided. "I am disillusioned with how medicine is practiced in this country but not disillusioned with being a physician. " Jauhar's sulfurous chronicle of the medical profession in the US begins almost as soon after he graduates from fellowship and takes a salaried job at a hospital (after 19 years of college education, including a PhD in physics). The hours are brutal, the money is meager, and before long he becomes part of the venal system, treading dodgy ethical terrain to keep his body, soul, and family together. He moonlights on other jobs and shills for pharma companies as he observes compromises, cronyism, and corruption flow like crud through the system. Doctors, hospital administrators, the health insurance sector, and pharma industry collude and conspire in sundry ways to rip-off patients - some who want to live forever despite being at their careless best. The dysfunction is not entirely due to doctors. Jauhar describes how external sources - the government, the insurance industry, and pharma companies - have all played a role. Doctors, particularly primary care physicians and internists, who previously spent 20-30 minutes with each patient, now hurry out after 10 minutes because they now have to see twice the number of patients to generate the same revenue. As a result, patients do not get the attention they deserve and are not diagnosed properly. Meanwhile, some specialist doctors get to bilk the system (which is why everyone wants to specialize and there are fewer primary care doctors in the US), prescribing a multitude of tests and treatment -some to cover for malpractice liability, others to generate more revenue. Patients who came in complaining of even routine breathlessness are hustled into taking nuclear stress tests and bumped into cardiac procedures. That's because insurance companies don't pay doctors to spend time with patients trying to understand their problem. But they pay for CT scans and stress tests whether they're needed or not. Elsewhere, hospital administrators are also constantly putting pressure on doctors to keep occupancy rates high enough to generate profits (somewhat like hotels). Jauhar cites the economist Julian Le Grand's idea of humans as knights, knaves, or pawns, to describe how the American system promotes knavery over knighthood. But most of all, once you read this tormented, self-lacerating book, it's hard to see a doctor with the same respect. Doctors know it too. In a survey cited by Jauhar, 30 to 40% of US physicians today say they will not choose the same profession if they had a choice; and even more would not encourage their children to. The medical profession, it appears, is terminally ill, in the United States at least.